A team of paramedic students sit around a table and contemplate the oxygen mask placed before them. A question hangs in the air – how would you manufacture such a vital piece of medical equipment if plastic was no longer available? What if geopolitical unrest, or in the longer term climate change, should create a shortage in key manufacturing resources. Would the health sector be prepared? Or would patient care and treatment be placed at risk? And what about clinical waste? Can the sector continue to afford to dispose of materials when the financial costs are so high? These questions might appear hypothetical to some, but they are being confronted head on thanks to an interdisciplinary module at Plymouth University that brings together students from nursing and the health professions with their contemporaries in design. We do this for our students – inspiring them with real-world challenges and the chance to work with those from other disciplines so that they can see new perspectives. ‘Nursing Sustainability by Design’ is entering its second full year, having undergone a pilot phase and then a roll out to around 350 nursing and midwifery undergraduates in 2013. Already it is creating interest, with the academic leads invited to present their findings at major international conferences, and a shortlisting in the Green Gown Awards – the most prestigious awards programme for sustainability in education. Professor Janet Richardson has been one of the driving forces behind the project, working with colleagues in the School of Nursing and Midwifery, and those in Education for Sustainable Development and the School of Architecture, Design and Environment to ensure the module is now embedded in the curriculum. It is during the clinical skills sessions, where nurses learn some of the practical abilities they’ll need during their careers, that the design students are brought in to observe, and then later take part in discussions around sustainability. They are then encouraged to respond holistically, generating a range of ideas to innovate product and packaging at a local or industry-wide level. Even in the space of one year, two prototypes have been developed and are being tested by students and academics. They include a device to re-seal packaging and a re-usable clinical dressing pack, both of which could potentially assist with training and practising skills and reducing waste. 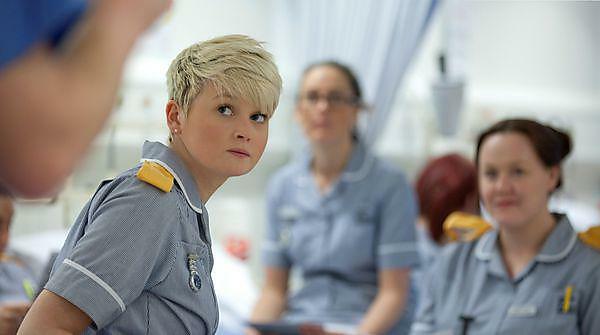 While the Nursing and Midwifery Council has yet to recommend that nurses and midwives have knowledge and skills relating to sustainability, Janet sees it as the University’s duty to prepare its graduates so that they can adapt and thrive in changing environments. I think the most significant things we have achieved are that we have developed a way of teaching sustainability to nurses that is relevant to their practice and changes attitudes, and that students learn to work with other disciplines. This year, 1,350 nursing and midwifery, and paramedic students will participate, along with 20 design students – and discussions are underway to include dental students from the Plymouth University Peninsula Schools of Medicine and Dentistry. The team is also developing a Sustainability and Health Skills e-tool training package for release in January 2015, which will include scenarios that are relevant to a range of healthcare practitioners and could be used in health and social care organisations as well as HEIs. The shortlisting for the Green Gown in the Learning and Courses category was one of three that Plymouth received in 2014. The work of the Peninsula Dental Social Enterprise – a community interest company that enables students and staff to run community programmes and initiatives – was shortlisted in Enterprise, while the University’s catering team was shortlisted in Food and Drink for their commitment to ethical and local sourcing.